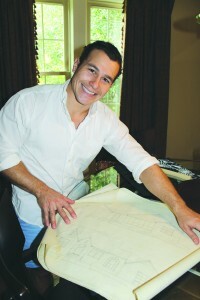 When young attorney Saul Newsome of Breazeale Sachse & Wilson purchased a home recently in Melrose subdivision, he began reviewing the original house plans, which were drawn up in 1950 by E. T. and W.H. Hastings, Jr. for Thomas A. Miller, Jr. Newsome’s inspection of the premises eventually led him to the attic, where he found a couple of old chairs that he pulled down and refinished. In the attic, previous owners had also left some boxes of old papers, which were mostly destroyed by rats. But, as he was throwing the messy debris away, Newsome noticed four pages of neatly-folded yellow legal paper in perfect condition. The papers contained an engaging short story based in Baton Rouge, probably from the 1980’s. Miss Laura was not afraid of very many things. At 84, she was too old and had experienced too much to be afraid. But now her hands shook and her old heart thumped in her chest. Miss Laura was waiting for the bus. It had been 20 years since she’d ridden the bus. Things had changed since then. Her great-niece Peggy had refused to ride the bus to high school, so Miss Laura’s niece Bobby and her husband had driven her back and forth until she was old enough to drive herself. Oh, she’d heard about the way city buses were now in Baton Rouge. Only near the campus were the buses safe — full of young college students. Everywhere else the buses were full of “blacks,” Laura quickly thought. After all, things had changed. Unfortunately, Miss Laura didn’t live near the campus. She lived out in north Baton Rouge in what most people called a degenerating neighborhood. Oh God, she thought, here it comes. She would have to ride all the way downtown toward First Baptist for her meeting. The big silver bus was heading down North Acadian, trailing the thick black smoke that Miss Laura had always avoided until Bobby insisted she was just too old to drive any more. As the brakes sang to a stop, Miss Laura said a quick silent prayer — God, let me live through this first ride! Clutching her huge, 20-year-old black handbag to her drooping bosom, Miss Laura mounted the steps and paid the driver. To Miss Laura, the aisle seemed at least two blocks long. It didn’t take her long to discover that 1) she was the only white person on the bus and 2) there was an empty seat about half-way down the bus on the left side. Slowly, as the bus hissed and moved forward, she staggered through the sea of bored chocolate faces to her seat. It wasn’t until she was just about to sit down that she saw the man in the next seat. Miss Laura involuntarily gasped. The man was young — probably between 25 and 30 (the worst age, she thought) and huge! No other word. He must have been slumped in the seat when she had gotten on the bus. Surely, he was a head taller than anyone else. His head was covered with tiny braids and a gold earring glinted and winked at Miss Laura from his left ear. He looks like a murderer, thought Miss Laura as she nervously turned her back to him and sat down. The bus became more and more crowded as it cruised toward downtown. Before long Miss Laura was the only one in a seat by herself and she breathed an audible sigh when at the next stop a nice-looking young white man got on and took the seat next to her. She glanced at him quickly and smiled a sympathetic and slightly conspiratorial smile. She knew how he felt. Just before the bus stopped where Miss Laura was to get off, the huge black man stood up and ambled to the front. Oh my God she thought! She prepared to die. The young man beside her got up to let her out and, to her immense relief, followed her down the aisle to the door. The three of them stepped off onto the steamy pavement. Smiling nervously at that nice young man and glancing in terror at the black giant, Miss Laura hurried off toward the church. Miss Laura had been riding the bus every Monday and Thursday for three weeks now. The return trip had proven less harrowing. The bus had hardly anyone on it in the early afternoon. She had gotten to know that nice young man, Charlie, who always sat with her. He was a kitchen worker at a downtown hotel. She was sure glad he was there — that tremendous black man had been on the bus every day. Today Miss Laura smiled pleasantly as Charlie got on the bus. She felt good today and it really showed. Charlie asked her what she was all smiles about. Well, she told him, the man who had spoken last night at the church had been so convincing that she had decided to give $300 of her precious tiny income to the missions’ drive. Why, she had the cash right there in her purse and didn’t it make a person feel good inside to give a little more than you really should! Charlie smiled at her. Miss Laura felt so good that she wasn’t really worried about whether or not that hulk behind her had heard until he was following her down the aisle to get off. Once off the bus, she experienced a momentary flush of worry. Quickly giving Charlie her customary parting smile, she hurried a little faster than usual toward the church. Once she turned the corner onto 5th St. she was safe. She slowed down and paused briefly to catch her breath. It was so quick Miss Laura only wondered what she was doing lying on the sidewalk. She only thought how odd and somehow stupid it was that she should just be lying there like an idiot. She struggled to get up and pain shot through her right hip and wrist but she didn’t think anything was broken. Still trying to get up, she noticed the huge figure and several jumbled yet distinct thoughts raced through her mind in just a split second. My purse is gone, that monster did it! He’s gonna kill me! Miss Laura was really in shock. It didn’t take her long to get over it though — and she still rode the bus. In fact, she wasn’t nervous as long as she knew Ed was sitting there behind her. She always smiled at him when she got on the bus and again when they went their separate ways when they got off. Sometimes, as he walked away, she would steal another glance at the back of that earring. Things sure had changed.